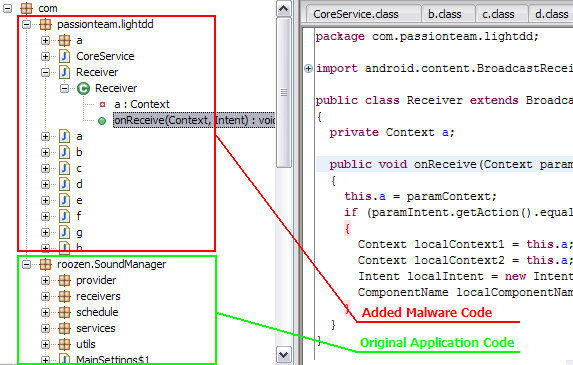 Android has become the main target for mobile malware. This application was originally harmless. However, a malicious developer called "Magic Photo Studio" downloaded the original application, modified it and re-uploaded it to Android Market. The malicious developer has inserted code that triggers when the phone receives a call. The added code will connect to a server and send details about the infected handset to the malware authors. So we're talking about a mobile botnet. Our Android security product F-Secure Mobile Security blocks this as a variant of the DroidDream trojan, with the detection name Trojan:Android/DroidDream.B. Dozens of examples of infected applications have been found from Android Market, uploaded under such developer names as Magic Photo Studio, BeeGoo and Mango Studio. Google has now removed them from the Market.